During the early part of of 2017, we had our 2nd ever hackathon in the OLX office. This served as a welcome break for the Product and Engineering teams while we we’re still formalizing our new set of projects for the new year. For my hackathon entry, I decided to work on the often overlooked area of office and organization tools we use — in particular the tools used by our Human Resources department. Oracle fusion was first implemented in 2015 as a global HR tool that can handle goal setting, appraisals and a way to see our organizational directory. The system was universally incorporated in all OLX countries as in the hopes that it would help transparency and communication between one office to the next by centralizing our talent and career data. There was a lot of friction when it was first implimented, most of it steming from system performance issues and a generally outdated and cluttered interface with bad usability problems. These we’re addressed in a 2016 update cleaning up the interface as well as simplifying the front-end tech stack. 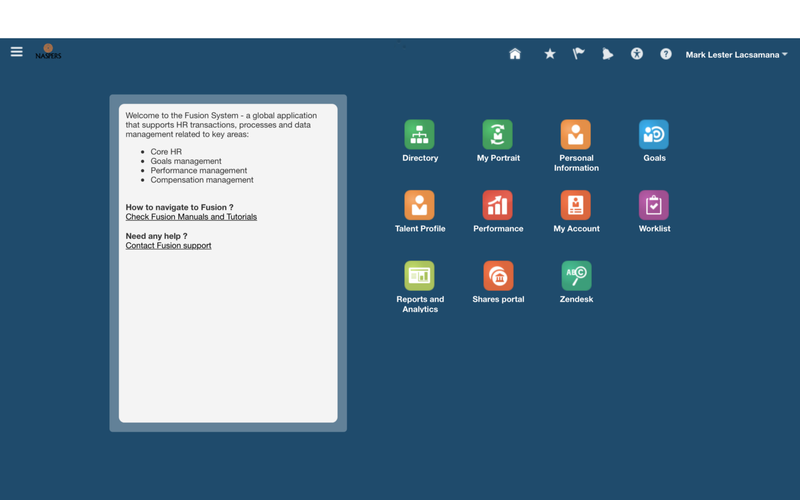 What the Naspers portal for Oracle Fusion looks like. Because this was a hackathon, there was a very limited amount of time to work with. I had to set my expectations pretty early to make sure that I was working at my best capacity. It was unlikely this was going to make it into production but at the very least I could show and accomplish a couple of things. Research and see what problems people we’re having with our HR software which we had become extremely complacent with. 2. Show that you can do user research in the leanest and most agile way even with remote teams. 3. Provide insight into how even the most mundane systems deserve a designers scrutiny. Because the system is being used in multiple departments it was important that we validate the problem we are solving. Since it was used in different continents and we had a limited amount of time for this hackathon, we needed to get creative with how we did interviews. Slack became a great place to gather experiences different employees with various roles had with Oracle Fusion from different countries. There we’re both good and bad experiences with the system. Many people see the value in the system as a centralized hub for all the data they need to manage their teams. People also understand that such a system needs to be secure as well as praising the 2016 update for making the system work faster. However there we’re a lot of comments and complaints regarding the system’s interface and information architecture. A specific interview also mentioned how the current security measures — where you are required to change passwords monthly — often leads to her forgetting what password she had. This was problematic as it caused her to enter her goals late each appraisal period and would often had to be nudged by HR. Another mentioned that because it wasn’t very intuitive, he needed to watch and study the tutorial video every time he needed to make and fix appraisals for his team members. This was further emphasized by another comment saying that even with the update it was still confusing. Though Oracle fusion has improved since first being introduced; issues regarding its user interface and information architecture are still evident are cumbersome and inefficient for employees. Because time was of the essense for this hackathon, we needed to be able to design and test a prototype right away. A visual and information architectural redesign was in order using Marvelapp as our means for creating a tappable prototype. Beginning with the homepage, we needed to focus on the important tasks people do on Oracle fusion. For us it was performance management (appraisals) and goals settings. The current homepage treats this more like a desktop without any hierarchy. Our redesign puts these important information upfront into a dashboard. Filling up your information was simplified. 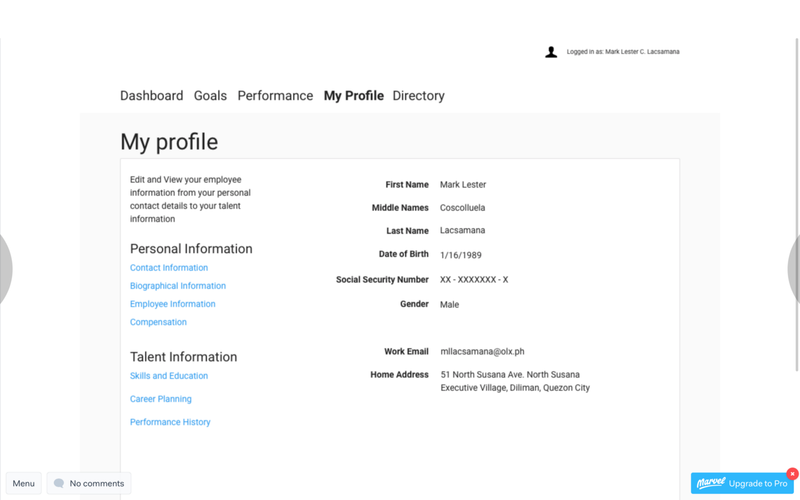 Previously personal information was spread accross three different sections: Talent Profile, My Portrait and Personal Information. All three of these are consolidated under My Profile now to lessen the cognitive load on loading the homepage with sub sections for Personal information and Talent information. 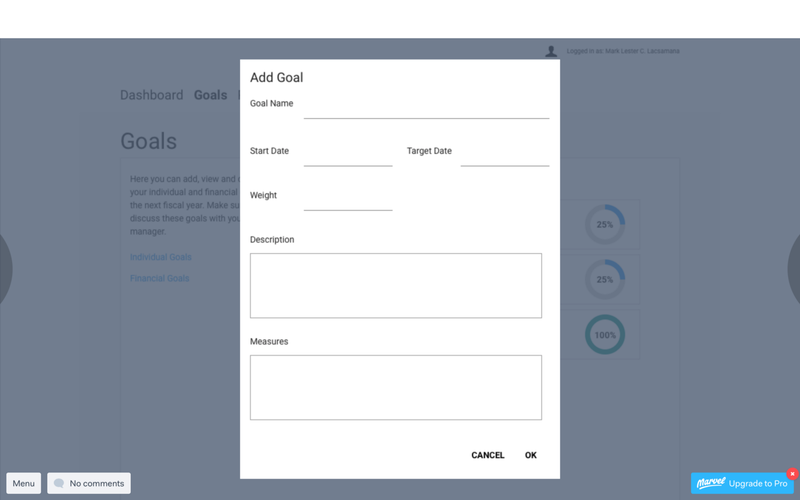 Goal setting was made easier using graphs and a simple dialog box interface. 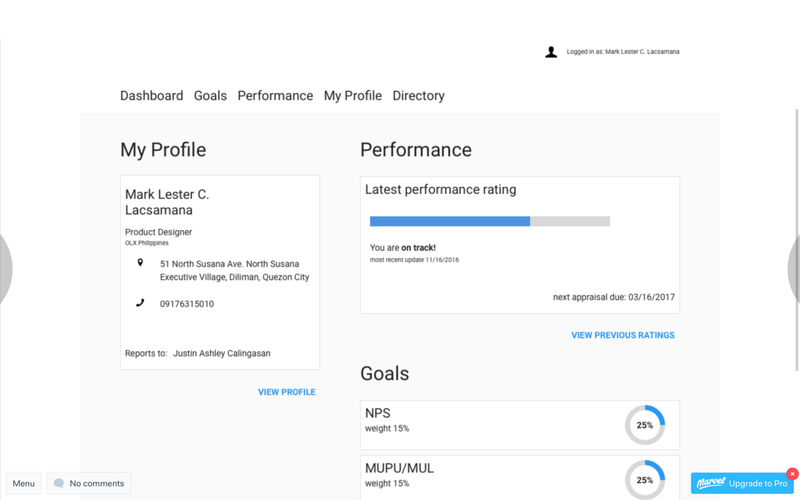 Adding a goal was as simple as tapping add goal and filling up a simplified form with the most important fields: The start date, the end date and the weight of each KPI. Though it was a pretty bare-bones-almost-wireframe prototype it allowed us to test a flows and ideas that made a huge difference with how people did specific tasks. Though this never went into production because oracle fusion was a third party service provider I was still able to accomplish the goals we set out to do. Even systems that are used by office staff deserve scrutiny under a designers eye. Just because it isn’t a consumer level product, it doesn’t mean it doesn’t need to be designed well. Making sure that systems such those used by HR and Administrative people are well designed not only makes the system look efficient but makes the people using them more efficient.